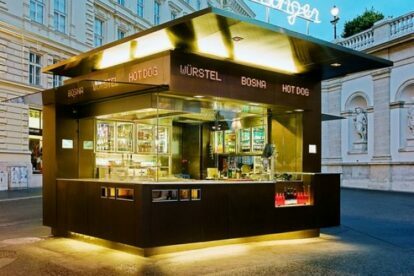 Bitzinger is a series of würstelstände in Vienna. It has won awards for its functional yet elegant design. Indeed, it looks quite posh from a distance: tastefully… er, cubic; bright yet elegantly coloured, clad in metal and with a neon sign. You’ll find two of them in the city if you’re interested. One is close to the Albertina, and the other one is situated at the Prater. The food isn’t bad, either. It’s standard sausage fare – no frills – starting at a lowly € 3 and building up to € 10 for the top-of-the-range burger. This is no assault on the senses the way other late night sausage stands can be. This is the kind of place that you’d come to in the day, or if you’re a tourist and you really need to try the odd cheesy sausage that your mates have been raving about (in the local dialect it is sometimes called Eitriger, or ‘the infected one’). Which brings me onto the location of the flagship stand: it’s behind the opera, in front of the Albertina and a mere hop, skip and a jump from the Burggarten, a favourite spot for many travellers in Vienna. Go on, try a sausage. You know you want to.